So, I was working on a post about my weekend – how the brakes went out in my car on Thursday and I needed to get my mom on Friday morning and take her for eye surgery and the kids were out-of-town so I had no backup plan and I totally didn’t know what to do – so I mowed the lawn. And I prayed that the Lord would help me figure the no-car thing out logically and as I was mowing I could see the house down on the corner. Not close enough neighbors to get to know, but close enough to see their house. They had moved in a few years ago and fixed it up with new doors and a well-tended lawn and new windows. And now they were being foreclosed. Why do banks literally feel they have to put all a person’s belongings on the front lawn? Is there not a more humane way to do this than to visually announce to the neighbors that a family is losing their house? I know a lot of times it’s the people’s fault, but I also know that sometimes it isn’t. A husband is disabled and the wife loses her job or whatever. I heard about the foreclosure earlier in the day before I got home and by the time I arrived, cars lined the streets. There was also a U-Haul and some other trucks, so obviously they had a lot of help. Seeing that changed my perspective. We were not losing our house. Our furniture was not on the street. I had a car problem … and I already had an appointment to take it in this week for another problem. So, I had a choice. Rent a car or chance it. When I looked at the car rental place online, I saw that it had already closed, so all I had left was to chance it. I had to get my mom to her eye surgery – no options. Which I did. And I made it. I did stop in and see a mechanic and he told me I probably had about 200 miles before my brakes completed fell apart and I’d be stranded somewhere (but he didn’t have time to help me out), so I’m carefully watching my miles (have a little under 100 left) and braking about a quarter mile from each stop sign much to the joy of the people behind me. But being that my mind wanders and I wasn’t really into writing a post on brakes, I was waylaid by an interesting discussion on Facebook. I am a member of a group that focuses on the area where I lived as a kid – a most beautiful corner of the world. One of the people asked me to post any pictures that I have since we lived in one of the more well-known houses in the area. Which I’ve been doing. Which has produced comments. Lots of comments. What’s here now and what’s there now, etc., etc., etc.. And my uncle bought your field and do you recognize this? Then I got to thinking about having Facebook in heaven. GIDEON: And then God spake to me and saith my men shouldest drink from the waters of the spring. ME: Hey! I’ve been there! GIDEON: Whereof do you speak? ME: Your spring. I saw your cave and the place where the men drank. I have a picture of my drinking from the same spring. 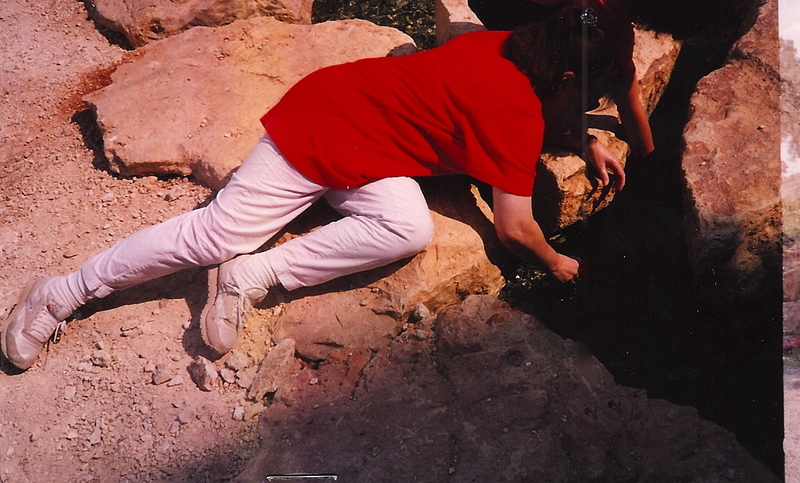 ME: Yes, the scholars have authenticated the location – in the Ma’ayan Harod National Park. GIDEON: Verily, what is a National Park? GIDEON: Thy words are too difficult for my ears. Think about it. Think how interesting a conversation that would be. Yes, I know this was a rambling blog post – but hey, I am transportationless and therefore, restless. And why is it dark before eight o’clock?